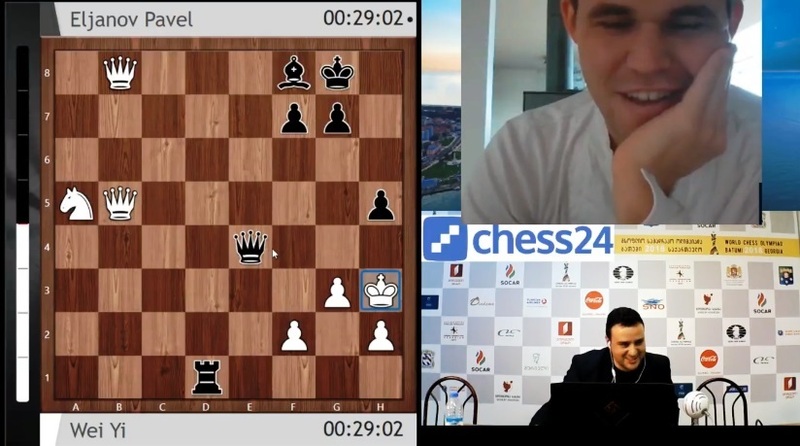 World Champion Magnus Carlsen sprung a surprise on Monday when he joined the chess24 Spanish Olympiad broadcast and spent 90 minutes discussing the Round 7 action. He talked about his preparation for the World Championship match and revealed it does bother him that the no. 1 spot he’s held for the last seven years might be in danger. He discussed the impressive performance of Jan-Krzysztof Duda and the Polish team and revealed what he thinks is behind the poor showing of the Russians. This is the danger. Also in this game the clock is ticking down, I think there are now 11 moves to go to the time control, and if you don’t find something you can get paralysed, and you just sit there and you’re thinking, “where is my win?” instead of just doing something practical that preserves a large chunk of your advantage. That’s how you lose! It’s going. I’ll be playing in the European Clubs in about two weeks. Really excited about our team from Valerenga – it’s a really nice group of players, and people. I’ll have a training session after that and right now I’m just relaxing, trying to keep up with what’s going on and to get in shape for London. In case you missed it, check out some footage and quotes from Carlsen's recent training camp in Kragerø. I would like to give you some boring, politically correct answer, but the truth is, yeah, it does bother me! I’ve been the number one in the rankings every single day for about seven years and it is unpleasant to have him and, I suppose, Shakhriyar as well, breathing down my neck. So well, I’m hoping he’s not going to catch me, that’s for sure! It doesn’t look like he’s going to win today, but who knows. I think he still has a long way to go when it comes to experience and understanding, but he makes up for a lot of it by being very energetic and extremely optimistic as well. It’s always interesting to watch his games because he always goes for it, he never plays for a draw. I don’t even think Tomczak is a young player - I think he’s been around for a long time. Just recently he’s made a bit of a surge, and it’s funny, apart from Duda [and Wojtaszek], the rest of the team, at least rating-wise, is weaker than it used to be – the old guys like Bartel and Socko are not playing anymore, Krasenkow, obviously, though that’s a while ago. Piorun’s made a surge, and Dragun has been playing extremely well. I don’t believe that they will win the Olympiad - I would say at this point United States are still the favourites, provided they can at least make a draw against Azerbaijan – but it’s fun to see that a team like Poland can do that well. I always felt like Poland was a team that was about as strong as us, the Norwegian team, and it gives hope for us as well! Magnus: "Ayayay, this is much too complicated for me!" What hope do the rest of us have? Pepe: What do you think about this Maghsoodloo? He says he studies 20 hours a day. Magnus: Then he should be sleeping more! First of all they’re struggling today, as well! They have two games left, and it’s far from obvious. I think Jakovenko is just worse, probably. 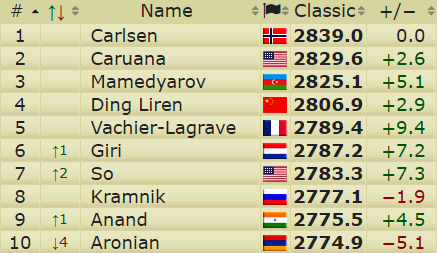 They’re not doing themselves any favours this year by excluding two of their strongest players… [Svidler and Grischuk] a luxury that most teams cannot afford. And it may turn out it’s a luxury they cannot afford either! 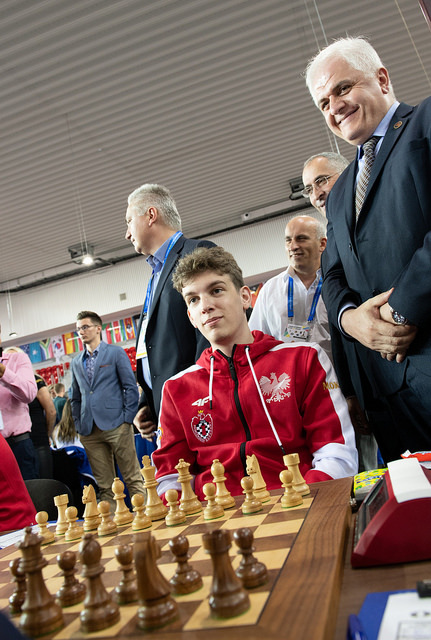 Tune in to chess24 for continuing coverage of the Olympiad. There’s a good chance Magnus will be back again for future rounds!